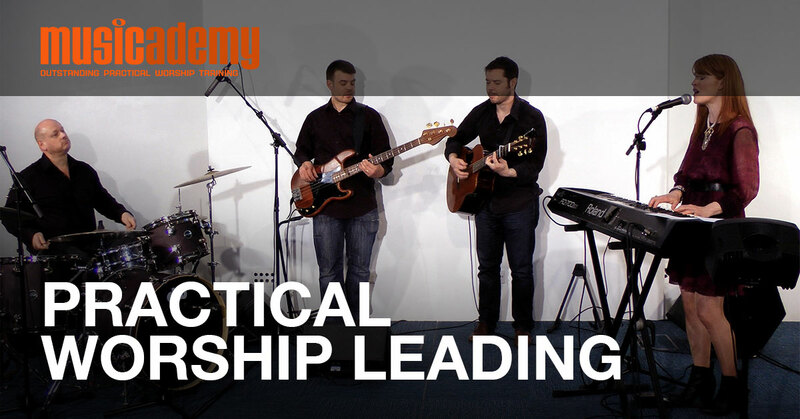 A comprehensive 20 lesson course on practical worship leading presented by veteran worship leader and multi-instrumentalist Tim Martin with assistance from the rest of the Musicademy team. The courses covering an essential range of practical skills that every worship leader needs, but probably hasn’t been taught! First we unpack working with songs. Choosing songs, pitching songs in singable keys, teaching new songs and building a balanced and manageable song repertoire for your church. We explore practical skills involved in leading those songs well, plus the skills to train your band to play those songs better. There is excellent content on team recruiting and team building and we include some invaluable music theory based skills to help you transpose those songs into playable keys and even alter the chords to reflect different moods and responses. We’ve not found a worship leader who wouldn’t want to write songs, but many don’t know how, so we unpack practical ways to help you get started. We recognise most worship leaders also sing so we’ve put together some vocal warm-ups, exercises for developing your and your team’s vocal range and even ideas on how to care for your voice. As worship is very much not just about singing so we’ve included thoughts on how to engage your congregation in non-musical expressions of worship. Finally there are some invaluable top worship leading tips born out of the collective years of experience of the Musicademy team. The course can be worked through as an individual or together as worship team and at the end of each lesson there’s a practical exercise practical exercise to help build the learning into your team’s everyday skill set. 20 lessons, each with optional practical exercises covering the following topics. Recruiting and evaluating new team members Building an effective team Creating worthwhile and efficient rehearsals The Worship Leading course is presented by Tim Martin, well known at Musicademy as the presenter of our Keyboard, Orchestral Instrument and Band Skills courses. A multi-instrumentalist, Tim has worked in various worship leading and music minister roles and is currently Worship Director at E&A Church in Bristol. He is a graduate of and has taught on the Theology, Music and Worship course at London School of Theology and has previously worked as a high school music teacher. The course also features specialist input from Andy Chamberlain, Nicki Rogers and Marie Page. Watch on your own or with the rest of your team – each session includes a discussion or practical exercise so that the whole worship team can work through the topics covered.